This spring I've decided to get the soil in the garden boxes and the other food growing areas in the yard analyzed for soil health. I want to make sure all the elements needed for growing delicious nutrient abundant food are available to all my veggie and fruit producing plants. More nutrients and more flavor, who can argue with that? I live in the Pacific Northwest which has a wonderful maritime climate where some vegetables can grow year round. My best books with information on growing food in this climate are Growing Vegetables West of the Cascades and Gardening When It Counts by Steve Solomon. His focus is on taming and enhancing our acid prone soils to create optimum growing environments for the produce we enjoy all year long. He has "serious food gardening experience" and he continues to evolve in his knowledge of gardening in the Pacific Northwest. 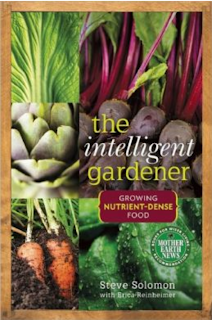 His new book The Intelligent Gardner: Growing Nutrient-Dense Food takes soil evaluating for growing nutrient dense food to the next level. Increasing the level of nutrients in the garden not only keeps your vegetable plants growing strong but also makes them tastier with more health benefit. In a veggie garden what more could you ask for? This book goes beyond focusing on N(nitrogen), P(phosphorus), K(potassium) and pH to remineralizing the soil to increase the building blocks we nurture our plants with and making the garden a balanced system that needs less annual additions of everything. I've collect soil samples, sent them off to the lab and am excited to see the results and get my soil on the path to producing nutrient dense food. I love that Steve really connects the soil health to our health.